Over the past few years, most of us have made a musical sacrifice: We’ve switched from listening to CDs to listening to MP3 files, and in the process we’ve lost some of the nuances of the music in order to have easily portable digital tunes. But what if you could have your MP3s and your high-quality audio, too? That’s the promise of iHome’s iP1, an iPod speaker dock that claims to restore what compression technologies like MP3 take out. iHome says that the iP1 uses “a complex chip-based algorithm” developed by Bongiovi Acoustics to restore “harmonics, brightness, clarity and presence” while also boosting the bass. How well does the technology work? To my ears, it sometimes works a little too well. The iP1 has a blue button marked with a B that turns the special technology on and off. There’s no doubt that engaging the algorithm makes a big difference. The volume jumps up, and both bass and treble become more pronounced. iHome says that the iP1 boasts 100 watts of power distributed among four speakers; but I found that without the B button on, the iP1 wouldn’t be loud enough to drive any self-respecting party. With rock and pop music especially, using the algorithm can have a good effect. But I found it harsh and unnatural on a jazz piece like Dexter Gordon’s version of “Don’t Explain.” The sound of brushes on cymbals was so bright and distinct that I found it grating. I also heard a consistent and annoying fuzzy sound below the music on the iP1 I tested. It was particularly noticeable on quieter pieces, such as classical piano works in which it came and went rhythmically, almost like the noise that a scratched LP would produce. I tested the same track on other iPod docks, and the noise disappeared. The iP1 has a sleek, modern design that I like, but it won’t necessarily be everyone’s cup of tea. The dock’s two 4-inch woofers and two 1-inch tweeters are stuck through a plate of smoky plastic, with the backs of the speakers on display. 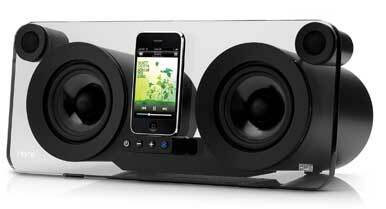 The arrangement does provide more separation between the speakers than you find in many iPod docks, and that seems to contribute to good voicing between different instruments. The iP1 comes with a remote that follows the current superslim-controller trend. At about 4 inches long, 2 inches wide, and 0.25 inch thick, it’s pleasantly light (but easy to lose in the couch cushions). The buttons don’t give much tactile response, since they don’t travel far when you push them. The iP1 will accommodate any iPhone and any dockable iPod. If you don’t have an iPod or iPhone, you can plug anything with a headphone jack into the back of the iP1. The unit also has component- and composite-video outlets, so you can send video from your iPod to your TV. The iP1 is visually striking, and its digital enhancement of compressed music is helpful with some genres. But there are other speaker docks that produce a more natural sound, and I was annoyed by the fuzzy hum underlying the music on the iP1.